New York, New York, April 25, 2017 – President Jeremy Travis has been recognized as thought-leader at the 2017 Tribeca Film Festival’s Eighth Annual Tribeca Disruptive Innovation Awards (TDIA). He was presented with the TDIA for his work on prison reform and social justice issues during a ceremony held on April 25 at the Tribeca Festival Hub in Manhattan. According to the award organizers, “This year, TDIA will celebrate an exciting roster of visionaries, rebels, and game changers who are upending their industries, altering the human experience through their novel approaches to social justice and activism, and affecting the future of intelligence, both human and artificial.” Paula Kahumbu, CEO of Kenyan Conservation NGO Wildlife Direct; Tory Burch, CEO and Designer of the Tory Burch lifestyle brand; Vivian Nixon, Executive Director of College & Community Fellowship; and Pulitzer Prize-winning journalist Jose Antonio Vargas are among the diverse field of 2017 honorees. 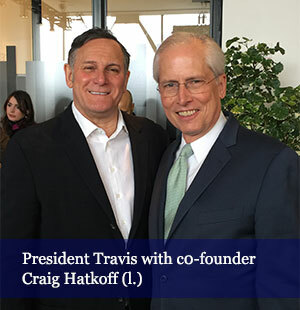 In addition to his 13 years of transformational leadership at John Jay College, President Travis has been a leading voice in the criminal justice reform movement. Most prominently, he served as Chair of the National Research Council Committee on the Causes and Consequences of High Rates of Incarceration which produced a landmark report recommending significant reductions in the nation's prison population and was a member of The Independent Commission on New York City Criminal Justice and Incarceration Reform that recently called for the closing of Rikers Island. TDIA is a collaboration with Harvard Business School Professor Clayton M. Christensen and helmed by Tribeca co-founder Craig Hatkoff. Christensen’s original Disruptive Innovation Theory was immortalized in the Innovator’s Dilemma, now celebrating its 20th anniversary. Disruptive innovation explains how simpler, cheaper technologies, products, and services can decimate industry leaders almost overnight, for the betterment of society. TDIA showcases applications of disruptive innovation which has spread far beyond the original technological and industrial realms into the fields of healthcare, education, international development, politics and advocacy, media, and the arts and entertainment. For more information, visit https://www.disruptorawards.com/.